ST. GEORGE — A bicyclist was struck by a car pulling out of a driveway Wednesday morning, necessitating an unexpected trip to the hospital. The incident happened just before noon at the University Plaza on 100 South. 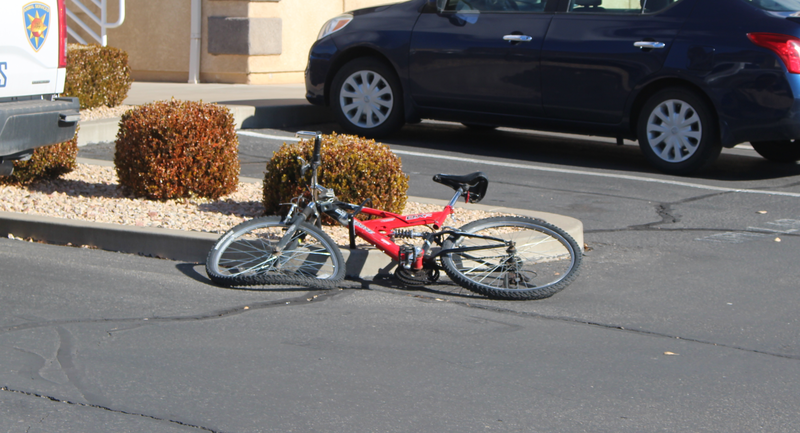 St. George Police Officer Jamison Hale said the driver of the car was looking, but did not see the bicyclist. The car hit the bicycle and knocked the rider to the ground. Hale said that by the time he arrived, the cyclist had been treated and loaded in the ambulance ready to be transported to Dixie Regional Medical Center in St. George. Hale said the driver of the car was issued a citation for failure to yield to a pedestrian. It sounds like the bicyclist was 1) on the sidewalk and 2) going against traffic. Not good but somewhat common. The bicyclist should have been cited as well. Sorry to say that this has become a more common occurrence in and around SG. As fine a job as the city planning group has done, to make SG bike-friendly, riders must always be on the lookout for drivers who are not attentive. Defensive riding continues to be mandatory, especially when navigating city streets. The good news is that we have plenty of alternate paths to get around town, and the bike routes are very helpful. Motorist should fight that citation. Bicycles are not allowed on sidewalks.